The MSP serves in the two dioceses in Taiwan, namely, the Diocese of Hsinchu and the Diocese of Taichung. The first Chinese mission was opened on July 20, 1989 in the Diocese of Hsinchu through Fr Carmelo Horlador MSP. He was teamed with Fr Joseph Biliran, an MSP Associate Member from the Archdiocese of Manila. 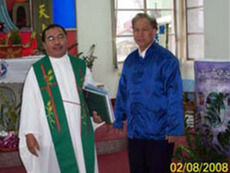 Twelve years later, the MSP accepted the invitation to work in the Diocese of Taichung. Fr Reynaldo Lipat MSP, the first MSP sent to that diocese, arrived on September 20, 2001. He was later joined by Frs Eliseo Napiere MSP, Agustino Jugadora MSP and Jimmy Cabuntucan MSP. At present (2010), there are five MSP priests working in the Diocese of Hsinchu, namely, Frs Julian Amamangpang MSP, Nemesio Uy MSP, Reynaldo Paculob MSP, Reynaldo Lipat MSP and Carmelo Horlador MSP. While in Taichung, there are two priests: Frs Agustino Jugadora MSP and Eliseo Napiere MSP.